The classic role of a priest and mystic is as healer. Healers are part of the trinity that exists in TERA: Tank, Healer, and DPS. They provide heals, buffs, debuffs, damage prevention and utility to a party. As the lifeblood of the party, it is important for healer players to be able to stay alive, quickly assess the overall team status, and respond appropriately. Gear and build requirements are not as stringent for healer players; there is more room for build variability as success is more dependent on player skill. However, it is still a good idea to strive for best gear since the team lives or dies by the healer, and every mistake or failure from the healer is amplified greatly. This guide covers the PVE basics for priest and mystic healer players, as well as briefly covering possible builds. This does not cover the possible DPS aspects of healers. For a more in-depth PvE Mystic guide, read Zephya’s Mystic Guide. For a more in-depth PvE Priest guide, read Ming’s Priest Guide. Your number one priority is to stay alive. Once you go down, your party can and often will go down quickly as well. That means you should always heal yourself before you heal others. Never sacrifice yourself trying to save someone else. You can always resurrect them at a safer time, but it is much more difficult for your party to save you. It is important to always be aware of what is happening during a battle. Never let a boss out of your sight or you might be taken by surprise once you turn your camera away. Your next priority is to keep your party alive. You should use both heals and tactically used damage reduction (Kaia’s Shield, Warding Totem) to aid with this. The priority is Healer > Tank > DPS. If you can keep everyone alive, then you should be making sure everyone in your party is fully buffed. If someone fell in battle, make sure they are rebuffed if you are a priest. If you are a mystic and died, make sure your auras are back on. If you completely run out of mana as a mystic your auras will deactivate, make sure to turn them back on. Keep your buff uptime as close to 100% as you can (Energy Star for Priest, Aura of the Merciless for mystics). You should also keep awareness of consumable and CCB usage from your party. Your next responsibility is to debuff the boss. That means glyphed Triple Nemesis for Priests and glyphed Volley of Curses for mystics. Mystics also need good awareness of party steroid skill usage and brooch cooldowns when casting Contagion. After making sure their red bar is filled and buffs and debuffs are taken care of, make sure their blue bar is filled as well. This becomes more important as you play with better players and their need for mana grows. Properly optimized rotations leave them low on mana, so make sure you use your mana infusion skills as soon as the cooldown is up. Be particularly mindful of this for the more mana hungry classes such as sorcerers. Players without mana cannot dodge or save themselves, so it is important to pay attention to not just their health but their mana as well. Proper positioning is one of the most important aspects of playing a healer. The proper positioning changes from boss to boss, but generally it is either to the side of the boss (triangle formation) or behind the DPS (line formation). Some fights require healers to be extremely mobile (such as SSHM Nightmare Imperator), while others may require them to stay very strictly in the same position (such as DS2 Meldita). The key is knowing the boss moves, including the range and animation timing. Always stay mobile and readjust positioning based on the situation. A common pitfall that many starting healers fall into is being animation locked in the face of danger. Many of the healing skills, such as Focus Heal (Priest) and Titanic Favor (Mystic), have long casting animations that causes the healer to be vulnerable. This can be avoided by casting skills only after a boss has started the animations for a move as well. Resurrection can be dangerous for healers if not done right. Being intimate with boss moves will help decide when you will have enough time to finish casting resurrection safely in time. Always make sure to cancel your resurrection (by moving in any direction) if a potentially lethal move is about to hit you. Remember to keep the boss on your screen so you can see what it is doing at all times. The three major builds for healers revolve around three possible stats for healers: Cooldown Reduction (CDR), Attack Speed (AS) or Crit Factor (Crit). Each has their own philosophy behind the build, and each will have its avid advocates. This build only became available after the release of the Dreadnaught and Starfall gear. This build is available for all current patch gear. The CDR build benefits include being able to give more support to your party from a wider arsenal of skills, such as more mana from more frequent Mana Charge (Priest), more damage reduction from more frequent Kaia’s Shield (Priest), and better uptime on buffs like Energy Star (Priest). Mystics would be able to give the party more overall dps by having shorter Contagion cooldowns. CDR also gives more defensive capabilities to the healer, as it lowers the cooldown on the iframes such as Backstep (Priest) and Teleport Jaunt (Mystic), lowers the self-heals such as Heal Thyself (Priest) and glyphed Healing Mote (Mystic), as well as gives more “lives” by being able to cast Grace of Resurrection (Priest) or Vow of Revival (Mystic) more often. A CDR build would have lower attack speed than an Attack Speed build. Inexperienced healers may have more difficulty with being caught in animation lock during combat with lower attack speeds. This can be remedied in two ways: consumables and proper playstyle. Attack speed is readily available from consumables such as Nostrum/Prime Battle Solution, Bravery potions, Struthio Breast Salad and Lein’s Dark Root Beer. Healers should always wait for bosses to start an animation, before casting long-animation skills such as Focus Heal (Priest), Titanic Favor (Mystic), Energy Star (Priest), Volley of Curses (Mystic), etc. See the Animation Lock section for more details. This guide recommends this CDR build as the standard healer build. This build is very highly recommended for mystics, due to their higher cooldown skills. Attack Speed > Cooldown Reduction > Heal > CritThe higher attack speed stacking allows for faster casting of skills, which reduces animation lock. This build may be preferred by healers who primarily rely on the lock-on heals or are less experienced with the boss moves. Higher attack speeds can allow safety in high pressure fast-paced situations. Being able to resurrect faster, cast heals faster, buff faster can allow the healer to stay safe more often, instead of being caught in animation lock when targeted by a boss. The downside to this build is that the iframes such as Backstep (Priest) or Teleport Jaunt (Mystic) become shorter, requiring you to be much more ping-dependent and precise with your iframes. This build is equally viable (as the CDR build) for priests. This is less recommended for mystics. Crit > Attack Speed > Heal > Cooldown ReductionThe idea behind this build is to improve your overall healing output by hoping to crit your heals more often. This is an advanced build that may not be recommended for newer or inexperienced healers. Crit build requires maximizing your gear (expensive for starting players) and often sacrifices survivability (harder on inexperience healers). For those that are experienced and well-equipped, this build may generally provide an increase in healing output. Although this guide will not recommend this as a standard healer build, this is an equally viable build for those that meet the requirements. These rolls are based off the assumption that the gear has already been masterworked. Replenish 0.6% of total MP instantly when you use a skill. The top recommended skill line depends on your class, so please consult a guide for your class for more details. Increases Endurance by 4 (12 on Slaughter and Imperator). Raise max HP by 2.3%. Increase Crit Factor by 6. The standard weapon crystal setup for healer classes is Swift, Carving, and two Brilliant crystals. If you find yourself with mana issues often, you may choose to replace the Carving crystal with an extra Brilliant crystal. The standard PVE armor crystal setup for healer classes is four Hardy crystals. For Ruinous Manor (Hard Mode), you may use 4x Relentless crystals, or 3x Relentless + 1 Swift crystal, or a mix of Relentless + Hardy (personal preference, as long as you hit over 160k HP). Recommended for more difficult dungeons, or less geared healers. Recommended for more experienced healers. There are many different possible jewelry choices for healers, and many of them are simply based on personal preference and playstyle. Even with the Ninja patch, the jewelry options remain the same because there are no healing pieces in the Maze or Vain jewelry sets. This is the easiest Crit Jewelry set that can be obtained by healers. Because the new jewelry sets only have Crit or Power options, only the Crit jewelries are relevant for healers. However, they can be rolled for healing options. For those that can afford to craft, the upgraded Crit Jewelry set would be Manorborne x3, Blubred x2. The Shadowvain can be replaced with Blubred, which is crafted from Manorborne jewelry and Battleground-earned materials. The jewelry rolls are a little more flexible depending on whether you want more survivability or more healing. This was previously the default jewelry set that many healers will flock to as their jewelry setup. This set is still an option for defensive healers, as it provides more HP. UPDATE This set is no longer viable, since the Hyderad Settings had the healing rolls nerfed. If you are using this set, it is recommended to upgrade to the newest crit jewelry pieces. This set used to provide the highest healing power by far. If you are still using this set, please upgrade to the latest patch jewelry. The Hyderad Settings were obtained from doing the old green daily quests in Bastion (located in Veritas District province in South Shara). [See the Hyderad Setting guide for more information on how to obtain them.] If you happen to have Improved Noctenium Rings or Bands of Health that used to drop from the Alliance Vault a long time ago (no longer available to obtain), you can use those too as they can have the same stats as Hyderad Settings. You can’t reroll Bands of Health though, so if they don’t have the Increase your healing skills by 4.52% healing roll, you shouldn’t use them. This set gives up on the endurance lines current patch rings offer, so keep this in mind if survivability is a problem. You also give up on a lot of ilvl using these Hyderad rings, so if you are struggling to meet ilvl requirements for dungeons, they may not be the right choice for you. Increases your healing skills by 4.52%. Hyderad Setting rings are level 60 rings and you can’t use vyrsks with them, so you will have to use zyrk crystals with the rings instead. You can use either Succoring or Grounded Vyrsks with the Argosy/Pinnace jewelry. This set focused on attack speed. The Frostwise Bands (2% attack speed) can be obtained from the Alliance Vault and the 5-man Vault of Allies, while the Signet (2.5% attack speed) is from the 5-man Vault of Allies only. You can’t reroll these, luckily the attack speed bonus is fixed. 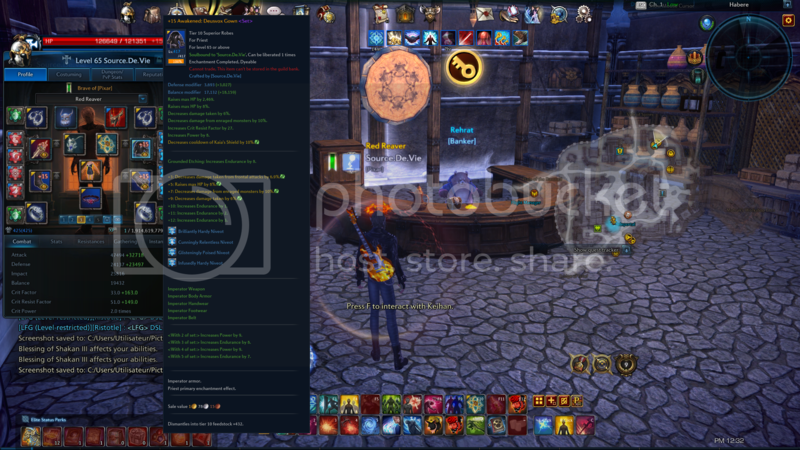 You might want to run vault until you get bands/signet with 2% healing power. Note that you can only wear one signet, but you can wear two bands. This set gives a significant amount of attack speed and crit factor, at the sacrifice of a lot of healing power. Swift Vyrsk set is recommended for this set. Consumables have different effects and duration, and give different boost. Here is the list of consumables and their effect and when to use them. With the Spellbound update, this single nostrum-style consumable has replaced the previous Charms, Nostrums and Scrolls. You do not need to be out of combat to pop this. If you have elite status (NA), the Everful Nostrum provided on the Elite bar provides the same effect for free. You must always pop this in combat, as it provides the necessary mana, speed and endurance, amongst other perks. On a short 10 second cooldown, this is a must-have that can add to your survivability. Add Health Potion and Valiant Potions to add on to your HP potion options. Having mana potions on hand as a healer is very important. This will help in situations when you are low in mana and prevent you from being able to use skills. Add Divine Infusions to add on to your MP potion options. Bravery increases attack speed by 4%, attack damage by 10% and defense by 10%. Those boosts are significant, but the ways to obtain those are limited. It is not a must have consumables, but try to use them if you can afford it. If you don’t have many of them, it is wise to save them for important situations. Bravery potions gives you both an attack speed boost as well as a defense boost, which are both important for healers. Noctenium Infusions increases your heals. Nocts are a good item to boost the power of your heals, but they are luxury consumables. For priests, they speed up the cast time of resurrection. For mystics, they prolong the duration of Contagion. Salads help boost two important stats for healers as well as a small heal over time, but because of their rather expensive cost, they are luxury consumables. Use Blessings to auto-resurrect at the same place, after you die. It is not mandatory, but they are highly recommended for healers. They can save you and your party a lot of time if you can save the party from wiping. It is recommended to have at least one in the inventory. There are three different types of goddess blessings: Federation Supply: Goddess’s Blessing, Goddess’ Blessing, and Goddess’s Blessing. They are consumed in this order, and if you have one (and only one) of each in your inventory, you can resurrect three times in a row. These Rootstock-originated foods increase your combat prowess by increasing your maximum stamina to 135 and preventing stamina from dropping. Having this increased stamina lets you benefit from greater effects from charms. This guide was co-authored by Floss and Banim. v2.0 – Updated for the Spellbound patch. – More fleshed out Jewelry Options comparison chart. With the new sets of jewelleries that only has crit and power, what are we supposed to use now? Jewelry can roll increased healing now (values being “Increase Healing by: 199 / 217 / 256” – https://www.essentialmana.com/gear/manor-accessories/). Healers don’t really benefit from power so you’d use the crit factor jewelry set. What you roll on it is mostly up to preference. You could roll more crit factor, you could roll increased healing, or endurance, or max HP, or mix. In my opinion, I’d mix some max HP with increased healing, or just straight increased healing if you got enough HP with Relentless crystals to do RMHM last boss just fine. Also, if you still got the old Argosy stuff, or can still get through old tokens, you can also use that. You’d give up on crit factor, but off the top of my head I seem to recall the Argosy set would give you more max HP due to base rolls, and probably higher heals. But, to not overcomplicate things, the new crit set is fine. Hello, I have modified some rolls with what you say here and with what Banim told me too, for exemple my imperator chest have all the rolls you say but not in the same order “same rolls and stats”, is the order important ? Someone told me that a priest crits only after 200, have changed my Dungeon config to get more endurance because I am not skilled, have noticed in DFNM that It’s really easy for me “just be out of mana all the time so I lust use mana skills and potions all the time”. But what’s the best to be protected a maximum “have turned yet all my jewels into endurance stats” I see the differcence in PVP because I do much better there now, but is it the same in Dungeons ? I am afraid to try it yet because I don’t want to make a team lose. Have you got perfect Endurance rolls for jewels ? Thanks for the guide, very helpful especially the multiple equipment builds! 1. What about an endurance/CDR or an endurance/atk speed build? 2. How much Crit is enough? I saw a detailed gunner guide that spoke of +150 crit being the max (for them) and that anything above it is just wasted as you crit everything with that. So how much crit is enough on mystic? If that were maxed, then other stats could be pumped up once that point is reached, like maybe a crit/endurance build? Has anyone given any thought to any of this? I am learning and reading a lot to try and master this class, but it seems to me that there is a missing angle for this class (or perhaps both healers) in that less squishiness and out of battle speed or even in-battle speed could play a more vital role. I am finding that positioning is very key, as is mobility to get in and out of tight spots to reach people to heal them. It is rare that I am struggling with CDR. The better the party, the more I can stand there and strategically heal, curse, drop balls and generally stay alive with no problems. But as soon as the party (significantly) weakens (I do a lot of instance matching – yes I know, I need to get a strong party and experience the other side of life), I find I am challenged with my mastery of dungeon mechanics and moving fast enough to keep myself alive and them too. With the faster speed (and if my endurance were a bit beefier I feel) I could do more in those hot spots where the party is a bit weaker. I do realize as well that nothing can heal noobness so I don’t take a loss when they cannot keep themselves alive long enough for me to turn around and heal someone else and turn back before they are dangerously low on health. So what does the healer community think? Am I just clueless on all of this? Or has someone already done the research and I just missed it? Healers should be squishier than other classes. They offset this by using a Swift crystal and by having mostly defensive gear. Defense rolled on gloves, defensive jewelry, Thrall of Life/Arun’s Vitae Motes, Thrall of Protection’s Glyph of Grounding, and Corruption Ring’s Glyph of Grounding. Crit heals are definitely not necessary. Many healers choose not to go for a Crit build because it’s not necessary and raw healing stats often outperforms it. Crit builds are mainly to do DPS with. As for speed potions and out-of-combat movement speed, that is an advantage mystics have. You shouldn’t need a Speed Potion to move around, but it could be helpful. Endurance and CDR/Attack speed are not mutually exclusive. There’s no where you can get only one or the other. Endurance comes from Gloves, Jewelry, and set bonuses. Attack speed comes from Gloves, Weapons, and Energetic Etchings. Cooldown reduction comes from Weapons and Energetic Etchings. You don’t need any crit, but you can just use a Carving crystal and Aura of the Merciless if you want crit heals. If you really want a Crit build, you should go for Crit earrings, Inner armor, Belt/Brooch rolls and then use Hyderad Settings to boost your healing. Crit isn’t as important on healers because overhealing someone does nothing and the Crit Heal Power is only 1.5x. Yes, learning how to position yourself and survive is most important for healers and this will come mostly from experience. Don’t be discouraged when you can’t heal carry parties. That’s not your role as a healer, and especially not as a mystic. If you can do it that’s nice, but you shouldn’t be expected to heal through people facetanking every hit and mechanic. Instance matching definitely isn’t something you should be basing your playstyle on. Usually I see healers using “Raise max HP by 1.5% / Raise max HP by 2.3%” for BOTH brooch and belt. Would it still be OK to go full HP, or would stacking some crit be better? Also this I am curious about, as you have belt full HP and brooch full CRIT- wouldn’t you get more of both if you rolled “Increases Crit Factor by 6 / Raise max HP by 2.3%” for each piece? As oposed to having one full HP and one full CRIT. Or is there a spesific reason for having HP on belt and CRIT on brooch? Then about rings: would you recommed having “Crit Factor 4 / Endurance 4” as rolls? Or is full endurance a lot better? I know most of my questions are probably up to preference, but still! Thank you in advance. For the accessories, i’m using 2 Pinnace accessories earrings, 2 Shadowgate accessories rings and Shadowgate necklace. 2/5 Pinnace for the set effect and HP, 3/5 Shadowgate for all those crit factors. Having full Pinnace accessory set gives like 3~4k extra constant heal compare to having 3 Shadowgate accessories but you will have low crit for that. In my opinion 80 extra crit factor is more useful than a mere 3k extra heal because more crit means more heal and self heal. In end game dungeons, your party members are gonna either lose chunks of hp when getting hit, or simply just get one-shotted so that little extra heal isn’t really helpful. Using a Crit factor onslaught scroll, you can crit pretty much all the time with the 3/5 Shadowgate set. In the end it’s preference. Having some crit accessories is viable and can work well. But I personally don’t like crit builds. Crit heals still happen without building for it, although of course at a lower rate. And they are not necessary at any rate, I run endgame dungeons too and nothing ever made me think “I wish that heal was a crit” because I can keep my party alive well without them and without any particular struggle. That 3k mere extra heal is still a 100% consistent 3k extra heal. Using a crit factor scroll is not recommended in my opinion, since you are missing on 10 attack speed from the aspd scroll. This can be especially bad if you are using a CDR build, unless you are really confident with the animation locks, and even then it would make some crucial animations (such as resurrection) much slower, getting a resurrection spell fast can make a huge difference, especially in boss fights such as second boss of SSHM (Dakuryon) when your party is trying to burn through mechanics to avoid balls/mobs from spawning. nice guide! how about rolls for jewerly? Which stats would you recommend for brooch and belt please? What about innerwear? What kind of brooch would you recommend though? I’ve updated the guide with belt and brooch (what type and what rolls). I will update the guide with innerwear later on, but I recommend the highest grade of fitness (HP) innerwear you can afford. Other viable innerwear choices are endurance and crit innerwear. What do you suggest for accessory crystals for the CDR build? I’ve updated the guide with jewelry crystal options. The three options I provided are all viable with cdr build, but I recommend either the succoring or the grounded set more. All the information is still relevant for the Ninja patch. The recommended jewelry is still the Argosy/Pinnace jewelry over the new crit jewelry and that is reflected in the Jewelry option section. The build recommendations are still the same and gear rolls are still the same. I may add a recommendation for different gear options for ilvl requirements down the line, but I still need a little more research on that. My priest with +12 Slaughter Weapon, +15 Starfall Chest, +12 Starfall Glove, +12 Slaughter Boots, Slaughter belt and full Dreadnaught Argosy/Pinnace jewelry hits 414. With Hyderad Settings, the ilvl drops to 411. Just a minor thing. Seems like you used the wrong in game icon for Struthio Breast Salad. The icon you used is Lamb Bulgolgi. Thanks for the guide, it’s very helpful! Looking forwards to a priest guide soon.